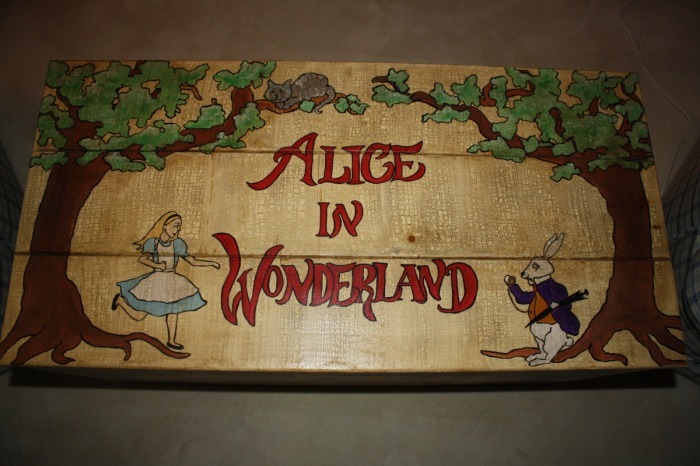 Transform a child's room into a fantasy land...Turn an old trunk into a cherished family heirloom...change a plain cabinet into a conversation piece...Kelsey's projects are completed in your home so as to fit your own personal style and wishes. 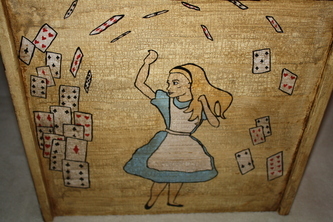 This toy trunk was painted in the style of the original Victorian-era illustrations of the first edition of Lewis Carrol's "Through the Looking Glass" for a small person who's a big fan of "Alice and Wonderland"! 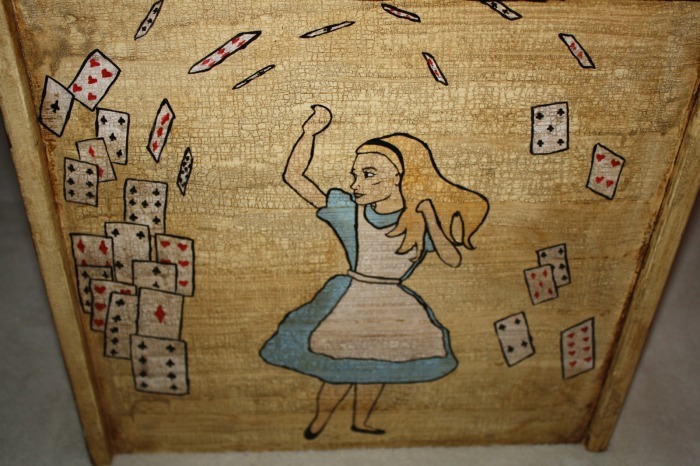 Her parents wanted a piece that could be displayed in their home after she had grown up. What used to be a plain wooden trunk is now a piece that is sure to be passed on from parent to child for generations to come. 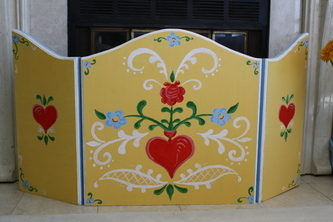 Designed and painted by myself and a collegue, this piece was created for a couple who wanted an original piece for their living room coffee table. 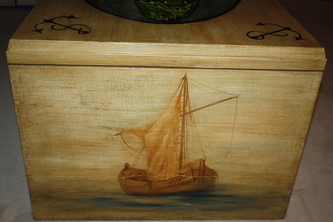 They had seen something similar in a magazine and wanted a weathered painted trunk that fit their sea-side decor. 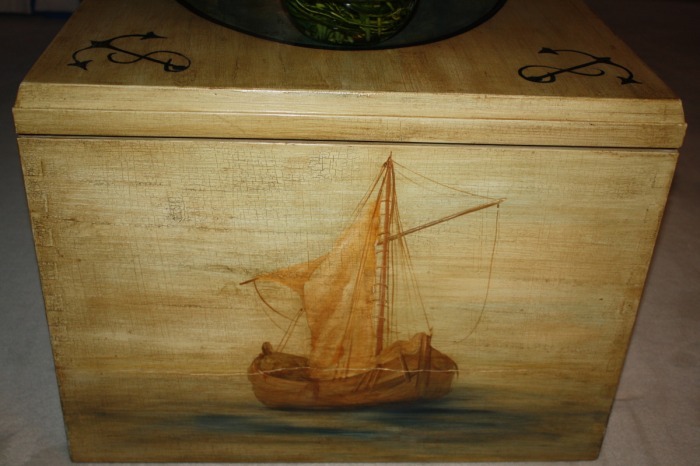 The trunk was then aged with crackle glaze and wood stain to appear about 100-150 years old, even though it was only painted in 2005! 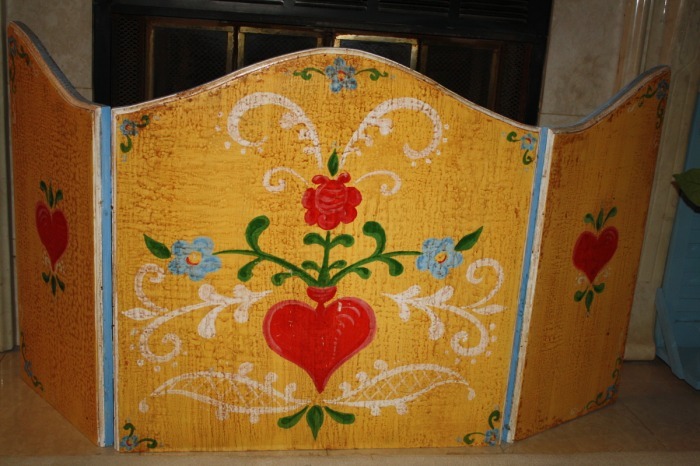 Custom Fireplace Screen: Client wanted to transform an old, plain fireplace screen into a colorful centerpiece of her living room, asking that it reflect her family's Swedish heritage. 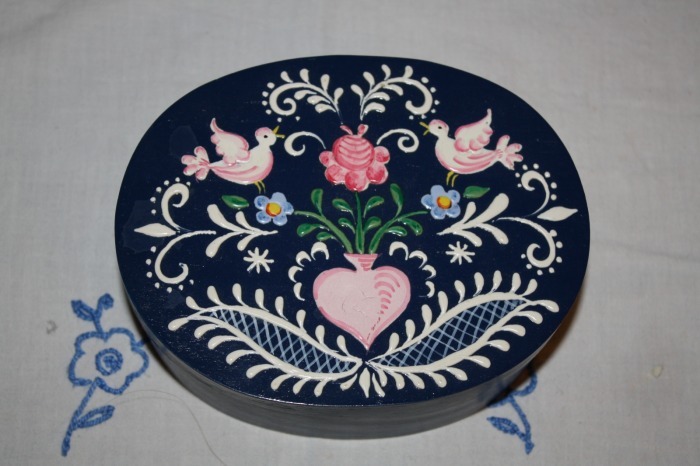 Inspiration came from Scandinavian picture books as well as this tiny jewelry box picked up on one of the client's travels. 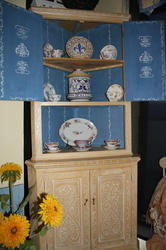 Once painted, a large crackle glaze was applied to age and "weather" the piece, making it fit in with her "cottage chic" decor style. 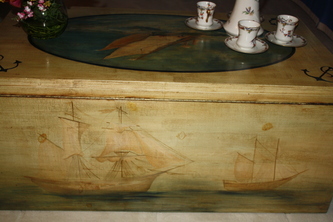 Clients wanted a place to showcase their collection of dishes in their seaside home. 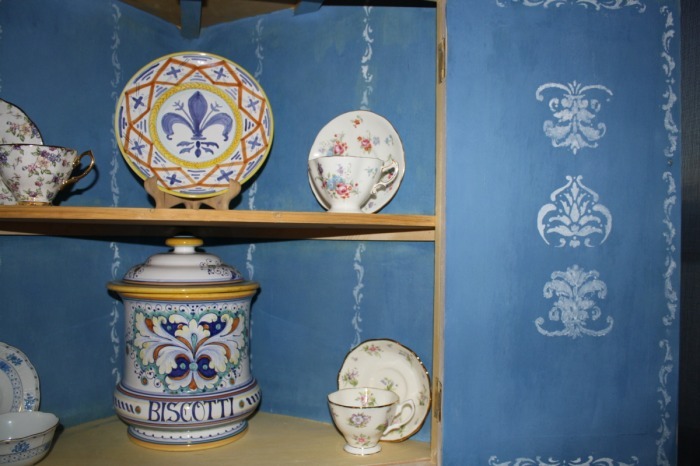 Kelsey took colors and inspiration from the dishes themselves to paint a simple, yet elegant pattern on the inside of the hutch, drawing the eye to the collection without overpowering the pieces the clients wished to showcase. 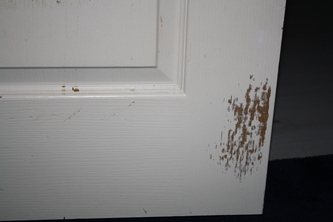 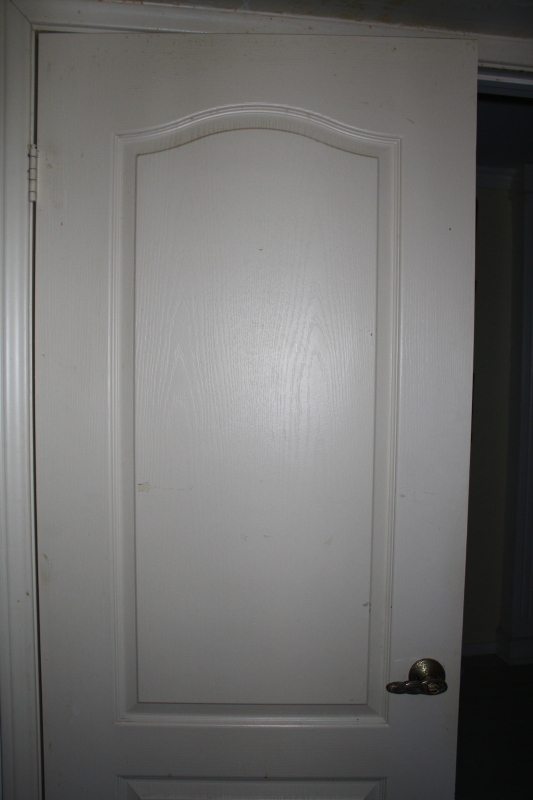 This bedroom door had been painted a plain, solid cream and was damaged on the bottom by the family dog (see 'before' photos). 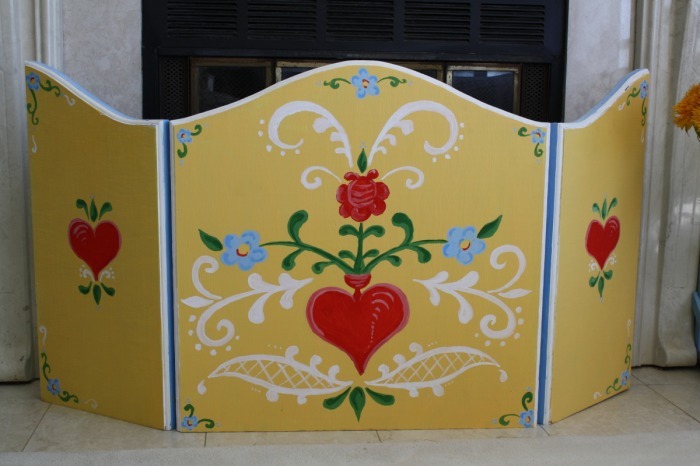 The client was re-decorating their bedroom in an Italian-inspired design. 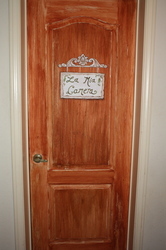 They asked for a door to fit that description and would make them feel as though they were entering an Tuscan retreat. 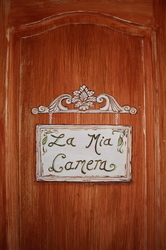 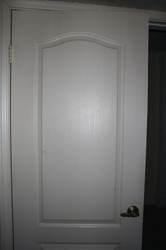 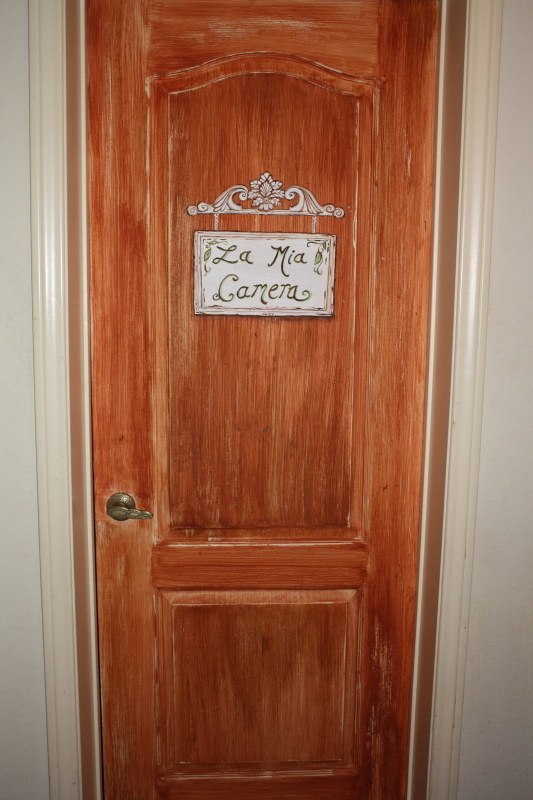 The door was given a warm, faux wood finish and completed with a painted-on sign stating "my very own room" in Italian. 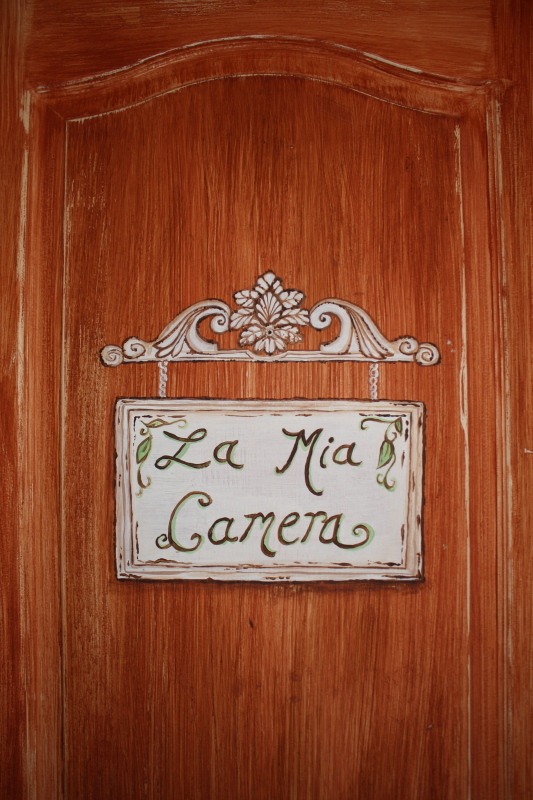 Inspiration for the sign came from a picture frame in the clients' bedroom. 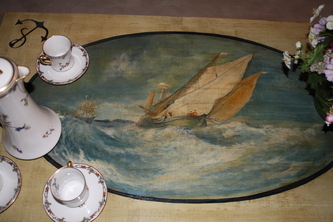 This was a piece I worked on with a collegue in a family's new home. 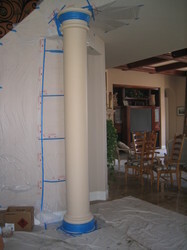 They were dissapointed with the plain beige columns at the entrance to their living room space. 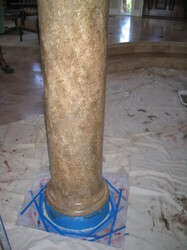 My collegue and I showed them examples of different colors and finishes of marble before settling on the above style. Many people who enter their home can't believe they're not real marble!